This takes slightly more effort than just bunging something in the oven, but only slightly more and it is worth it. 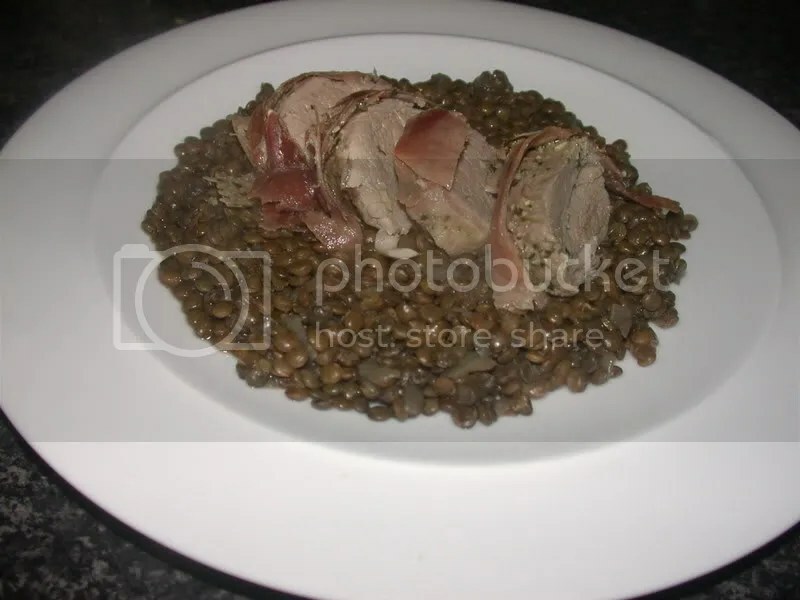 Pork and lentils are such a great match. Puy lentils. Judge for yourself how much you want. First of all, heat up the olive oil in a saucepan to a medium/high heat and chop the onion. When the oil is good and hot, bung in the onion and cook until softened but not browned (about 5 minutes). Add in the lentils and stir it well and cook for about a minute and then pour in some vegetable stock – enough to cover the lentils and then some. Because every time you cook lentils they’re different, you’ll need to judge for yourself if you need to add more stock as they’re cooking. I tend to top the stock up as I go so that it’s neither a big soupy mass nor dried out. Turn the heat down and simmer. Now smear the pesto over the pork loin all over so it’s well covered. Lay out the slices of parma ham flat and so they overlap slightly. Lie the pork loin on top of the slices and then wrap the ham round the pork so it’s tightly wrapped. If you’ve got some ham left over you can also fold some over the ends. Now wrap the whole thing in aluminium foil and put on an oven tray. Pop it into the oven for 15-20 minutes. By the time the pork is done the lentils should also be ready. Have a taste and season with salt and pepper if you think it needs it. If they’re a bit bland you can add things like Worcestershire sauce, thai fish sauce, mushroom ketchup. It’s up to you. Slice the pork and serve it with the lentils. Lush. mmm!!! sounds delish, mushroom ketchup ?, never heard of that!